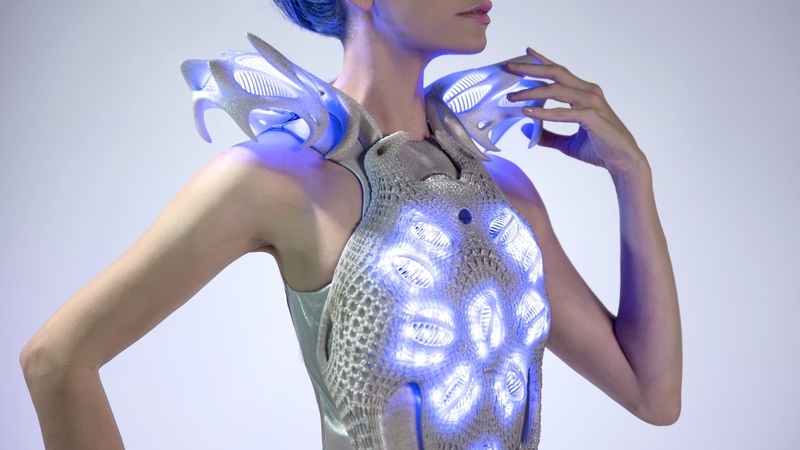 Intel is yet again dipping its toes in the wearable tech water, this time letting designer Anouk Wipprecht combine its new Edison chip and high end fashion. Hot on the heels of the announcement that Intel’s newest bedfellow, Basis, would be unleashing its Peak smartwatch sometime next year, the silicon giant has teamed with the Dutch fashion designer to create a dress which can, amongst other things, track your mood. Powered by Intel’s Edison chip, Synapse has been digitally designed and 3D printed using a flexible TPU 92A-1 material, which is a durable rubber-like plastic that can be cut and designed using a process called laser sintering. This is the first time the Edison chip has been actually embedded into a garment and it brings with it some truly unique, and slightly bonkers, features. For instance, one of the sensors built into the dress can measure proximity, so if there’s someone getting a little too close for comfort, 120 watts of brightness will erupt from an array of lights. There’s even a camera that can snap a picture whenever the user is feeling tense or relaxed, with the aim that you’ll be able to look back later and evaluate what exactly made you feel that way. Along with the dress, there’s also a matching headpiece, which we’re sure you’ve guessed is not simply there for decoration. In fact, it will track your attention level and let others know when you’re too busy for watercooler chit-chat. First introduced at CES 2014, Intel Edison is a computer designed for wearables that is slightly thicker than the size of an SD Card. Despite its size, Edison still packs a punch, with a dual-core Intel CPU, 1GB RAM and 4GB of onboard storage, along with WiFi, Bluetooth 4 and USB support. That makes it more powerful than the current crop of smartwatches. We’ve been wondering just what sort of wearable tech this little chip will power for a while and now with Synapse, we’ve got our biggest clue yet. Intel’s assault on the wearable market has been growing week by week, with the previously mentioned Basis Peak getting the brunt of the media attention. But, the chip maker has also collaborated with Opening Ceremony on the smart fashion bracelet MICA, along with watch brand Fossil on a supposed range of fashionable smartwatches. The Santa Clara based firm also launched a special competition called ‘make it wearable’, offering up $1.3m to the project with the best wearable concept. Now excuse us – we’re off to get our crayons and start designing.